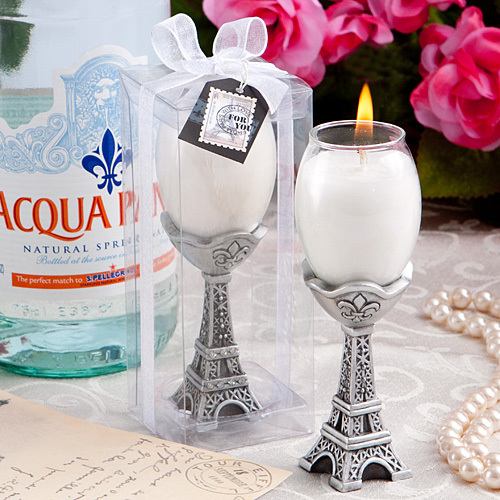 The candle holder base is made of antique silver finish poly resin with the carved details and construction that make the Eiffel Tower unforgettable. Nestled in the base is a clear hand blown glass candle holder bowl with a poured white candle inside. Together the base and holder form the unmistakable shape of a champagne flute ready for toasting. Each measures 4” tall x 1” wide. Clear rhinestone accents provide added sparkle. Attractively gift boxes as shown including a white organza ribbon and an attached vintage postage stamp design, complete with a “From Paris with Love” message.